Those who know me well, know that I’ve run a few marathons. I enjoy long distance races because the are challenging, fun, and epic. The races have been very rewarding, and I plan on running more of them in the future. 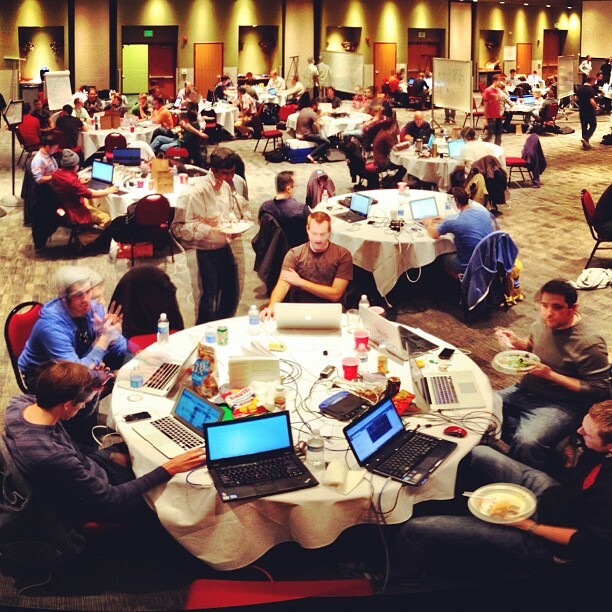 This last weekend, my experience at StartUp Weekend Salt Lake City was the equivalent of a web developer’s marathon. At the event, over 100 attendees came from all over Utah to see if they could build a business in less than 48 hours. On Thursday night, we listened to 57 business idea pitches, voted the best ones up, and formed into teams to see if we could make it happen. We all ended up in a room containing food, snacks, wi-fi, whiteboads, and expert mentors from a variety of fields, from entrepreneurship, to online marketing, to windows phone mobile development, to legal consulting. We had free access to anything a web-developer could possible want. We got complimentary accounts for services like email marketing, Voice over IP, and a variety of web services. It was like getting dropped into a machine shop with tons of free raw materials and all the powertools in the world. We were ready to make stuff. The energy in there was incredible. The air was buzzing with activity. While the developers we’re throwing down code, the business guys were hitting the streets. Several teams drove over to the South Town mall and talked to pedestrains about their concepts, looking for feedback. One team that was building a facebook app for collecting facebook addresses got kicked out of a bridal fair twice. Another team made over 80 phone calls to potential customers. 80 phone calls! The developers were equally ambitious. We had teams put together live videochat services, business apps, social platforms, productivity tools, mobile apps, and even augmented reality software. Together, it seemed like we knew nearly every language, framework, and platform that could be built on, from ASP.NET to Zencart. I’ve never seen so much talent in one room. There was no problem that couldn’t be solved by the collective skill and brainpower of these developers. Impressive, huh? Our web app is about 90% done. Hit me up if you are interested in seeing the final product in all its glory. The most remarkable thing about the whole event was the collaboration that existed between the teams. Whenever a team made a breakthrough, they’d cheer, and then the whole room would break into cheering and applause. This happened all weekend. We had teams going up to the mic, announcing that they needed design help, or assistance with facebook api’s, and other teams would rise to assist them. I’d never seen competing teams help each other out like this. We were helping people run beta tests, liking new company pages as they sprouted up on facebook, and giving feedback to other teams. Here’s the list of businesses that came out of our efforts. All in all, it was challenging, fun, and totally epic. What a memorable experience! If you have interests or skills in this kind of stuff, I highly recommend you participate in the next one. Odds are, you’ll see me there too.